Irvine dentist Dr. Jerome Tsang was born and raised in Cerritos, CA. At the age of twelve, his mom had asked him what he wanted to do when he "grew up." His answer was to be a doctor. With the support of his family Dr. Tsang continued to pursue this dream throughout his academic career. Dr. Tsang attended Gretchen Whitney High School, one of the top high schools in the state of California. He continued his education at the University of California, Berkeley and earned a Bachelor of Arts degree in Psychology. Then onward to New York University College of Dentistry, much to the dismay of his parents who wanted him to stay on the West Coast. While Dr. Tsang did enjoy his stay in New York City, his academic studies were his highest priority and resulted in him graduating in the top of his class, being inducted into Omicron Kappa Upsilon, the national dental honor society. Dr. Tsang attended a graduate residency program at University Medical Center in Fresno, CA, serving the local community and the veterans at the local VA Hospital. He finally moved back home to Irvine and lives there currently. 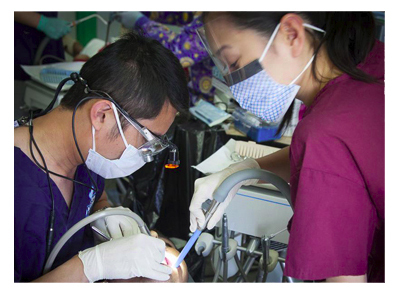 Dr. Tsang participates with Dental Care for Children in Ensenada, Mexico. Dental Care for Children provides free dental care with an emphasis on children, traveling into Mexico and Haiti to provide needed services. Irvine dentist Dr. Jerome J. Tsang, DDS, provides not just the best clinical care but also the best experience. 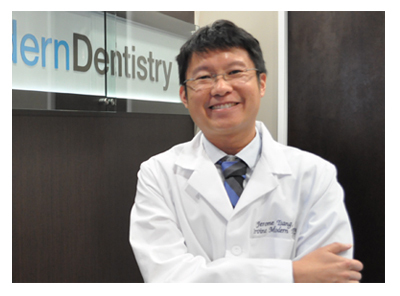 Dr. Tsang has heard numerous times from patients that "I hate the dentist, nothing personal." He understands that it can be difficult to see the dentist for various reasons and his focus is on providing not just the best clinical care but also the best experience. Irvine Modern Dentistry is designed with our patients in mind. Irvine Dentist, Jerome Tsang, DDS offers modern dentistry for the entire family. Located in Irvine, California, our state of the art dental office also serves patients in surrounding cities like Tustin, Newport Beach, Lake Forest, Costa Mesa, and throughout Orange County. Office hours: Tuesday - Friday 9am - 6pm, Saturday 8am - 1pm, Monday by appointment only, closed on Sunday.